The Call for Proposals for the 2019 Conference has closed. Thank you for all of the submissions! The numbers tell the story. More than 325,000 U.S. students studying abroad each year, but fewer than 30% are from underrepresented groups. And yet evidence shows, more and more employers rate "international experience" an important factor in hiring. Top-down approaches to address lack of diversity in study abroad have included marketing campaigns designed to reframe study abroad and scholarships pools designated to underrepresented students. But these efforts alone haven't opened enough doors. How can we dramatically increase diversity in study abroad including racial, ethnic, gender, religious, sexual orientation, socioeconomic status, disability, and age, so that it accurately reflects the diversity in today's student population? How does lack of diversity in study abroad affect the overall experience for students and conversely, how does diversity enhance study abroad? What predeparture, onsite, and re-entry protocol changes are needed to address participation by diverse students? How can we proactively design programs to support students' identities? Other than scholarships, how can we incentivize diverse students to invest in international education? As educators, we are called upon to ensure today's students become tomorrow's diverse and interculturally-savvy employees and leaders. Study abroad can make that happen. Let's create actionable ideas to tackle the study abroad diversity challenge together. 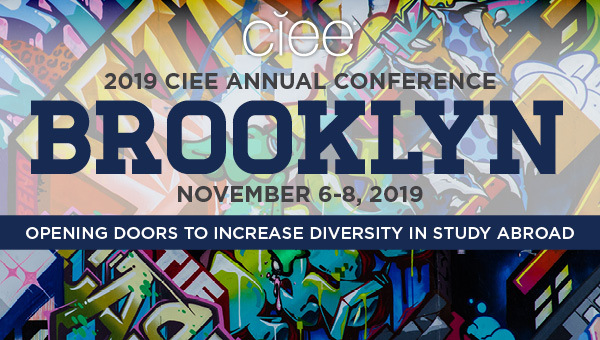 Submit your proposal today and us at the 2019 CIEE Annual Conference in Brooklyn, New York, November 6-8, 2019 to discuss approaches for reframing global education and developing scholarship structures designed to make study abroad a reality for all students. The CIEE Annual Conference features concurrent sessions, workshops, and a poster fairs. Submit a proposal that reflects fresh ideas, research, experiences, and knowledge that address the new realities of study abroad. Submit a proposal by February 11, 2019. Over two days of the conference, sessions are the venue for presentation and discussion of ideas around the conference theme and other relevant topics in study abroad. Proposals should include a comprehensive outline for a 75-minute session, including 15-20 minutes of audience participation and engagement. There should be no more than four presenters and no fewer than two presenters, including the chair. Represent collaboration or perspectives of both faculty and international offices. Proposals including faculty presenters are strongly preferred. Email us at conference@ciee.org, or call us at 1-844-411-3751. Stay connected by liking us on Facebook (CIEE Annual Conference) and following us on Twitter (@cieeconference)! © Copyright CIEE 2008-2015. All rights reserved.